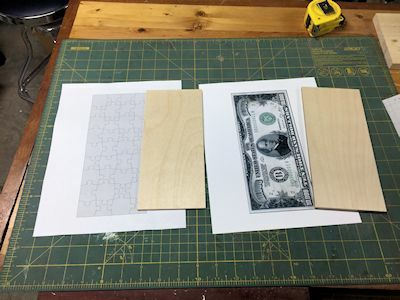 $10,000 Jigsaw Puzzle Scroll Saw Pattern. Sue Mey has her new e-Magazine out. Check out the patterns. I had an extra $10K bill in my wallet and I needed something to do. I said to myself. 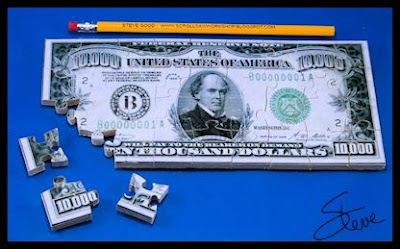 "Self, what better use could this $10,000 have than to be a jigsaw puzzle?" 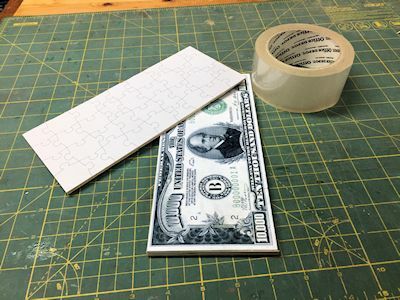 If any of you would like to send me your $10,000 bill I will promise to make a puzzle and send it back. Honest I will. Please send that in small unmarked bills. No dye bombs or tracking devices are accepted. No return address required. 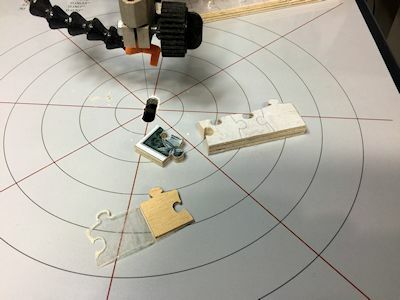 Scroll Saw puzzles are always fun and easy to make on the scroll saw provided you have the right materials. This puzzle pattern is 9" wide and 4" tall. 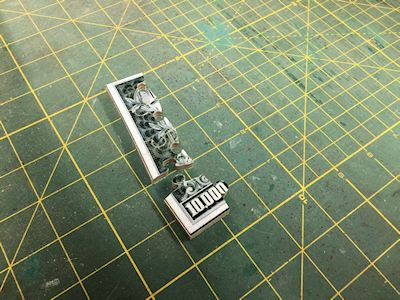 Here is my technique for making Scroll Saw Jigsaw Puzzles. I use Baltic Birch plywood because it is so stable. Cut two boards to the size of the picture. I like to use 1/8" thick BB for the template and 1/4" thick for the picture but that's not critical. Use what you have. The picture needs a permanent bond to the board. 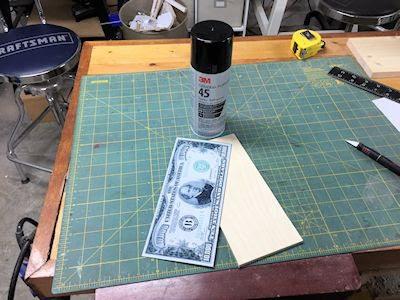 The instructions on spray adhesive say to achieve a permanent bond you need to spray both surfaces and apply pressure while it dries. Apply the template to the other board. In this case I have using matte photo paper to print the picture so I want to give it some overcoat protection. 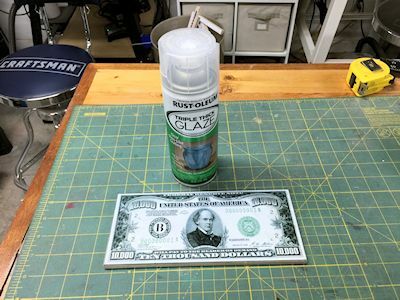 I am using spray acrylic. Just a couple of light coats is all that is needed. IMPORTANT: If you don't let the acrylic cure before you put on the template they will stick them selves together and make it impossible to get the template off later in the procedure. Using clear masking tape you need to make a sandwich of the two boards with the template on top. Wrap the tape all around the boards so that it will not slip while cutting it out. 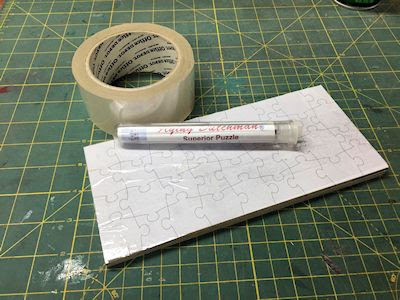 You want to use a very thin blade to cut puzzles. If the blade is too thick the pieces will fit sloppily. You can order special jig saw puzzles blades like the Flying Dutchman Superior Puzzle blades but I find that for most puzzles a #1 size blade is small enough. Experiment to see what works best for you. The #1 is easier to control the the extremely thin puzzle blades. I like to cut strips first. I then cut the strips into the individual pieces. 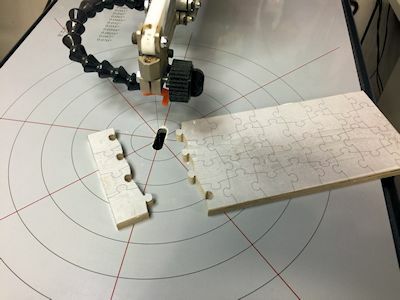 Remove the template board and you have your first piece of the puzzle. I reassemble the puzzle as I cut the pieces. If not then you have to solve the puzzle before you give it away. May that just ads some fun for you. If you enjoy making jigsaw puzzles I have a downloadable template book with all the standard photo sizes available. It is $7 and available for immediate download. The technique is the same and you can use your own photos to make great puzzles. 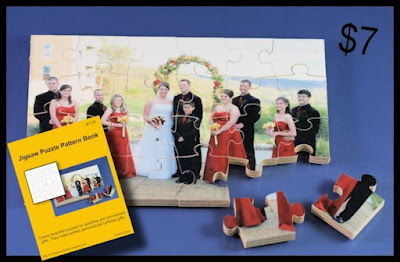 Wedding, birthday, anniversary photos all make fantastic good memory jigsaw puzzles. You can find it in my eStore. It's the third item down the page in the eStore. Click here to go to the eStore. I'm going to complete all the outstanding orders as soon as I finish this post. By the time you read this the order should be in you email box. Thanks for the orders and enjoy the patterns. Artistry in Wood show is this weekend: Come say hi. I'm getting excited. 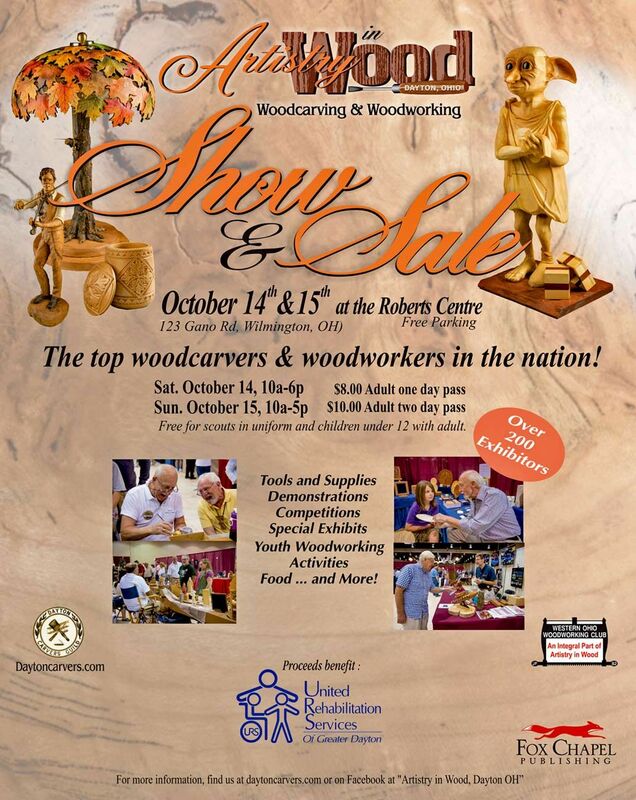 The Artistry in Wood show is this weekend. I am really looking forward to this show. There will be so many wonderful artist there that I just want to look around both days. I'll get a chance to look around but I also want to meet any of you who can make it to the show. 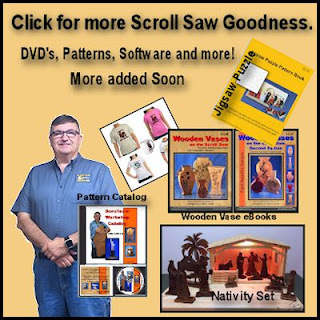 I will be a guest at the Seyco booth, Ray will be there with the new Seyco ST-21 scroll saw. Make sure you visit the booth and see this new machine. 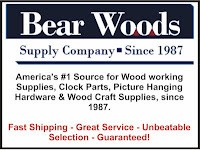 I am getting email every week letting me know how much people like this scroll saw. I love mine. You need to take it for a test drive and kick the tires. The show is held this year in Wilmington Ohio at the Roberts Centre. I have been there before and it's a nice venue for a show. I hope many of you have a chance to come to the show. 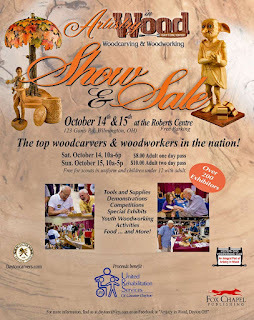 This show is primarily a wood carving themed show but lot's of people are trying to make a splash with the scroll saw. The more people we can get there the more likely other vendors from our community will show up at later shows. Sue Mey ask me if I would share her latest e-Magazine with you all. As always I an happy to share what she does. Check out the Dog and Cat Santa patterns. Those are special. Visit the Special Offers category for my e-Magazines.Check out my YouTube channel. 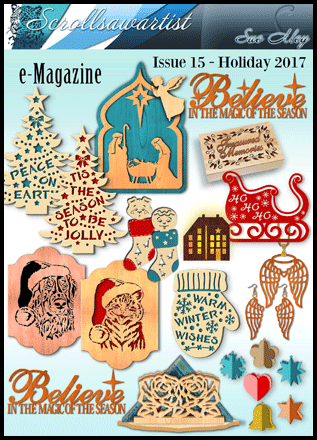 It has been a while since my last e-Magazine and I have received many requests for a Holiday issue. 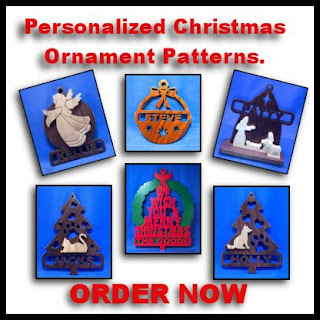 This pattern selection is therefore mostly for Christmas, with a few other projects added that would make great gifts, like the angel wings jewelry, the little tea light house, and the rose serviette holder. To see the table of contents, click the image below and scroll down the page to 'Description'. My eStore has a few items that you may find useful and fun. I have plans to expand the eStore with more items soon so check back every now and then to see what's up. I fully admit that I am a geek. I love gadgets. I have three Amazon echos set up in my house now and i love the technology. I have it read my audio book, set alarms, turn on and off the lights and more. 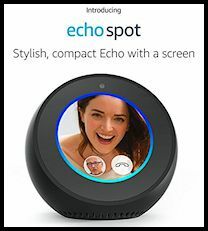 If you are interested in having a connected smart home the Echo is a great hub for many different devices. Amazon just introduced the Echo Spot. It looks pretty nice. Check out the features.